Periodical Cicada – Should you be worried? There has been a lot of press about the emergence of Brood II for the periodical cicada (Magicicada spp.) and it can either be an exciting time or one that’s a little nerve wracking! Cicada Brood II last emerged in 1996, it was Brood X that had the large emergence in 2004. While we know that there were populations throughout NJ during the 1996 emergence, reports are scattered and its hard to predict how big the populations will be and where they will be located. Periodical cicadas live underground for 17 years, feeding on tree roots and emerge en mass once soil temperatures are right. This usually occurs around mid to late May in NJ. 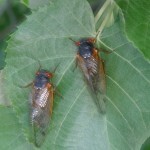 These are different than the annual cicada that we see around July. Biology: Cicadas are piercing-sucking bugs (yes, true bugs) that feed on plant xylem. This is a nutrient poor diet (mostly water) and is one of the reasons that it takes 17 years to develop. Avoidance of predators is the other main reason that the periodical cicada waits 17 years before emerging. Birds like to feast on cicadas and are probably their biggest predator. There are also a few parasitic wasps and predatory mites that will attack the eggs. Before nymphs emerge from the soil you may be able to see emergence holes about 1/2″ diameter around the base of the tree. The nymphs will crawl there way out of the ground and then molt to the adult stage, leaving behind their exoskeleton. You can see their specialized forelegs for clinging onto tree roots! The newly emerged adults will appear white (with red eyes) while their exoskeleton hardens. The adults are black with red eyes and red-orange wing veins. Adults are 3/4 – 1 3/10 inches long and females have a sharp ovipositor designed to lay eggs in tree limbs. The males begin to “sing” and form chorusing centers of large aggregations. Singing will peak in the morning around 10:00am (YouTube clip of singing). About 2 weeks after emergence, the females will begin to lay their eggs. Females select terminals that are about the diameter of a pencil and lay 10-25 eggs in a 1-4″ slit. A females can lay over 500 eggs in her lifetime. Soon after, the adults die and the eggs hatch about 6-10 weeks after egg laying. Then nymphs fall to the soil and burrow under – not to be seen for another 17 years. Injury: The biggest concern for fruit growers is injury caused by oviposition (egg laying). As noted above, females select small twigs and the site distal to the oviposition scar will die. This results in flagging and is a good indicator that you have cicadas. But don’t confusing it with OFM flagging! In tree fruit, this may cause limbs to break and can be especially damaging to young plantings where injury to new tissue needs to be prevented. 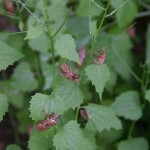 Some decreases in yield have been documented in NY apples from large populations of nymphs feeding on the roots but the biggest concern is the oviposition (egg-laying) injury. 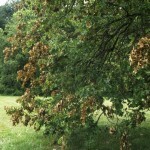 Secondarily, the oviposition site can become a site for fire blight entry in pear. Peach is not a preferred host, but injury in peach, pear, apple and grape can be seen, especially at high population densities and along wood edges. Grapevines, especially young vines are also subject to severe injury. The trunk and shoots can be oviposition sites. In all woody species, adults will feed on xylem during the day on a broad range on hosts (although this likely does not cause significant injury). Once we start seeing oviposition injury, I will update you with photos. Management: Management will likely only be needed if you have high populations and/or young trees. The pyrethroid insecticides are reported to be the best materials. Trials by colleagues at Virginia Tech (C. Bergh) reported that in 2004, Danitol and Asana were the best products at reducing oviposition sites and Warrior or the carbamate Lannate also reduced injury. Be cautious though because pyrethroids can easily flare mites and reduce populations of natural enemies. If you have BMSB populations, Danitol is also one of our few products with a 3day PHI so be mindful of the number of allowable applications on the label. Apple growers especially should not use Sevin due to its thinning properties. Alternatively, there are also reports that Surround (kaolin clay – OMRI approved) will reduce oviposition injury. Its possible that combining weekly insecticide applications over the short egg laying period with Surround may protect young trees. For small plantings, netting or remay covers can also physically protect injury. Scouting for populations of periodical cicada is needed before any management is applied! For more information see the Rutgers Fact Sheet, recently revised by Dr. George Hamilton. So, should you be worried? Well, the emergence of periodical cicadas is an amazing event! But as a grower, you will likely need to protect young trees (3 years and younger) and anywhere you see aggregations, which may be found near the woods edge. It’s probably possible to treat the few rows surrounding chorusing centers to reduce the injury related to oviposition and any small mitigating factors of the nymphs feeding on the root system. Otherwise, the internet is abuzz with some tasty ideas for cicada recipes! !